ALL 10 examples of a Ducati 1198 with custom paintwork have sold for £55,000. The sculpture is by artist ‘Horn$leth’ and features multicoloured paintwork with ‘Kill me fast’ graphics painted on the bike’s mid-fairings. The Ducati is currently listed on home design website Minimal Home but is no longer in stock. 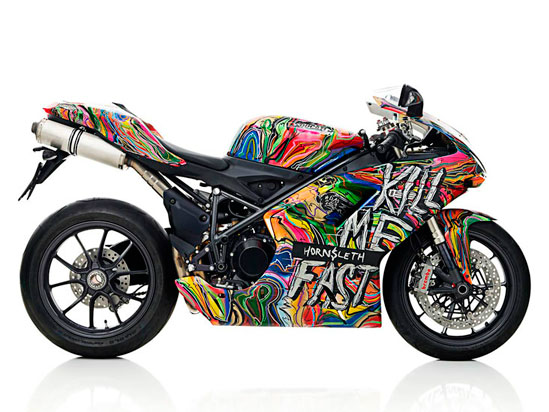 If you absolutely must have one, Horn$leth still has eight more examples of another customised Ducati 1198, this time with ‘Super Crash’ graphics aboard the multicoloured paint, also for £55,000.